Aye. Sorry, did I stress you out? My bad. With all the terribleness in the world, it can feel a little silly to be in the kitchen making the same variation of a pound cake recipe ten different times in order to figure out the final recipe worthy enough to be in your cookbook. It can also be a little frustrating too — my standards for the recipes that will be published in Weeknight Baking are much higher than the standards that I post for my blog, so I've been experimenting with a ton of different recipes, methods, and variations to try and get the final recipe to be as perfect as I can. And no joke: three-quarters of the time, my tweaks don't work out the way I want them to, leading me to roar in frustration, scrap the whole thing, and start over from scratch. Which is why on the days that I'm not baking for my book, I find myself reaching for recipes from tried and true sources. 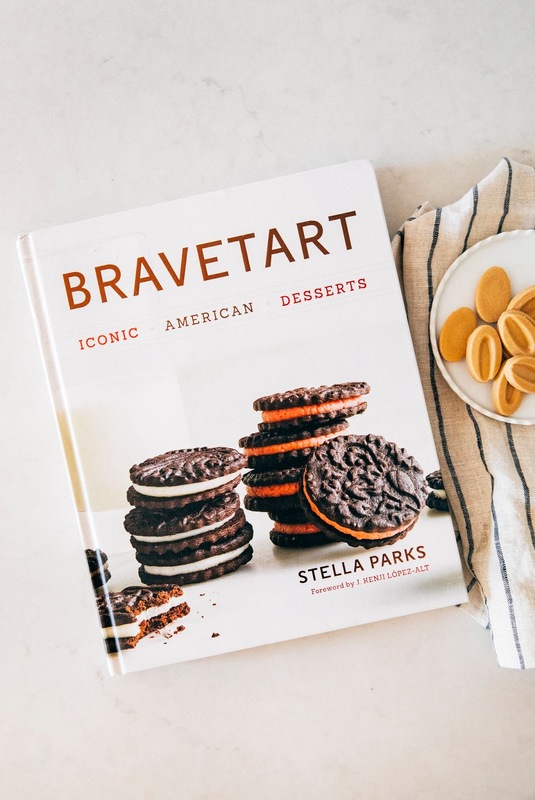 Like Stella Parks' new cookbook, BraveTart: Iconic American Desserts. If you guys don't know Stella's work, you're missing out. Stella is one of the OG baking queens of the internet; when all else fails, I turn to her blog to look at her recipes for pastry classics like creme pat and Swiss meringue buttercream. She's pastry-school trained and is currently the resident pastry wizard at Serious Eats, specializing in remaking American classics like Oreos and Sno Balls at home. 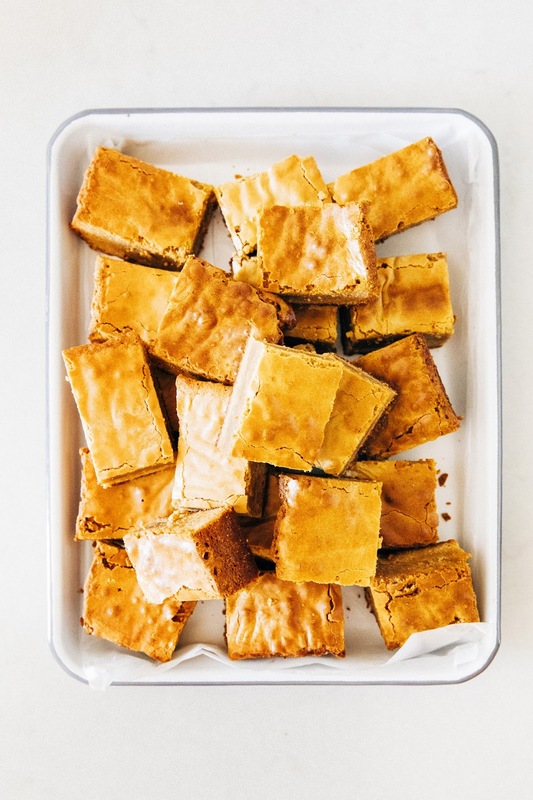 These blondies are from her new cookbook, and are everything you would want in a blondie: all butterscotch flavor with a crisp, sugar crackly top and the fudgy texture of a classic brownie. I was particularly enamored by her use of malted milk powder and roasted white chocolate, both of which give the blondies an extra caramelized flavor. Her cookbook has instructions for roasting your own white chocolate at home, but I'm partial to Valrhona's Blond Dulcey feves. 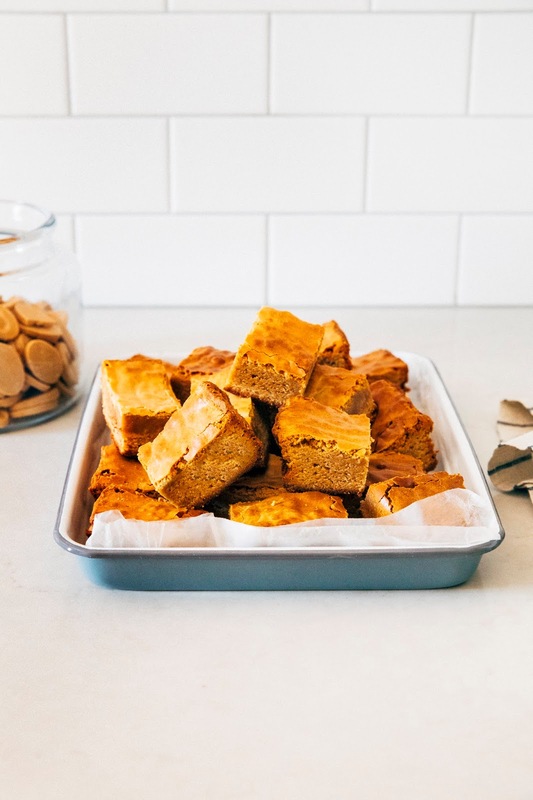 For a copy of Stella's new cookbook, head to my Instagram and like/comment the picture of these butterscotch blondies! I'll be selecting a winner randomly next week. Blond dulcey chocolate is available at Valrhona's online shop, or on Amazon. In a pinch, you can make your own by roasting your own white chocolate! Food52 has great instructions on how to do so, and of course, if you buy Stella's book, she's got a recipe on how to do it too. You can also use traditional white chocolate in this recipe (and it'll still be tasty, I promise! 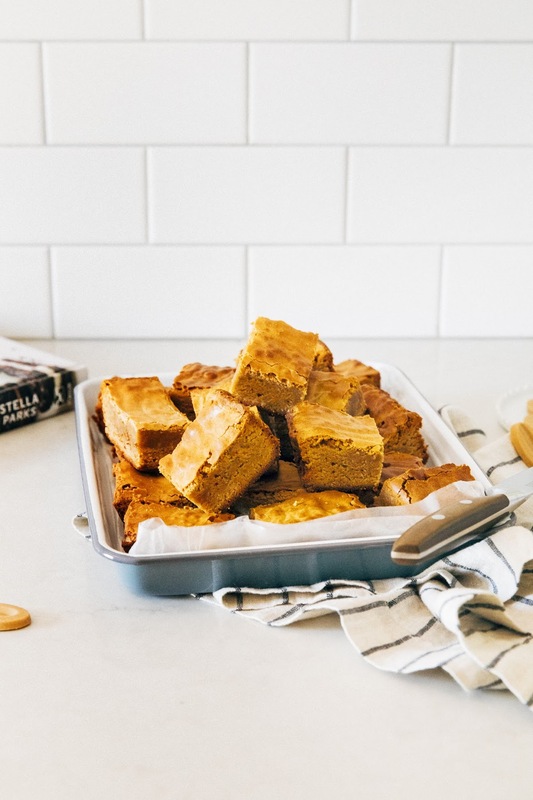 ), but know that your blondies won't be as butterscotchy as mine if you do. Center a rack in the oven and preheat to 350 (F). Line a 9 x 13-inch baking pan with two overlapping sheets of aluminum foil so that the bottom and long sides are covered; grease lightly. In a medium saucepan with a heavy bottom, melt 1 cup unsalted butter over medium-low heat. Increase to medium and simmer, stirring with a heatproof rubber spatula while the butter hisses and pops. Continue cooking and stirring, scraping up any brown bits that form in the bottom of the pan, until the butter is golden yellow and perfectly silent. Remove from heat and stir in 1 1/4 cups Valrhona Dulcey blonde chocolate; the mixture will seem quite thin. 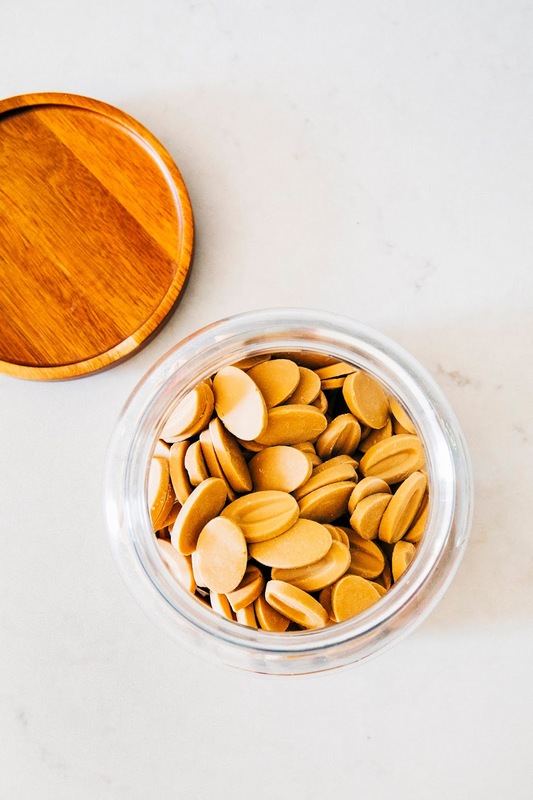 In the bowl of a freestanding electric mixer fitted with a whisk attachment, combine 2 cups light brown sugar, 1/2 cup granulated sugar, 1/2 cup malted milk powder, 1 3/4 teaspoons kosher salt, 1 tablespoon pure vanilla extract, and 6 large eggs. Whip on medium-high speed until thick and fluffy, about 8 minutes. Reduce speed to its slowest setting and pour in the warm chocolate-butter mixture (from the 2nd step). Once incorporated, add 2 1/2 cups all-purpose flour and fold with a rubber spatula to ensure that the batter is well mixed from the bottom up. Pour into the prepared pan and bake until the blondies are golden, glossy, and just barely firm, about 35 minutes. Transfer to a wire rack to cool to room temperature. 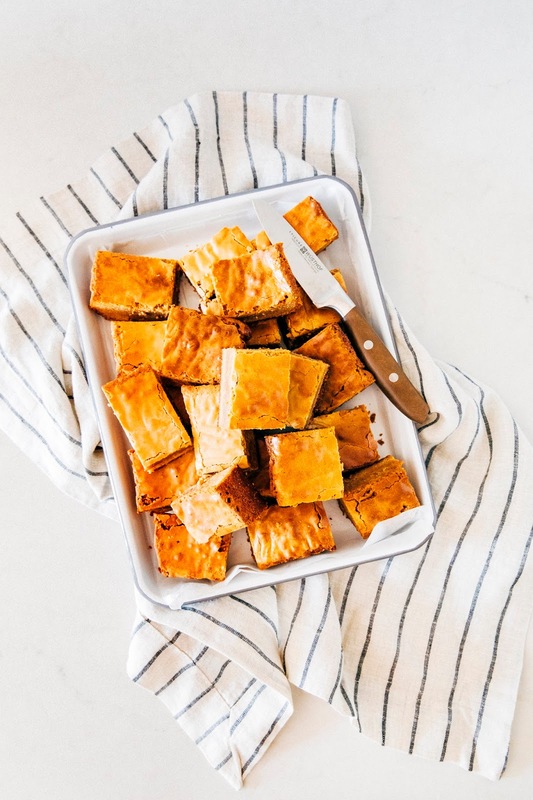 Once the blondies are at room temperature, tug the foil loose and lift the blondies from the pan. Cut into twenty four 2 1/4-inch squares. Store in an airtight container with a sheet of wax paper between each layer for up to 1 week at room temperature.